Alstroemeria which is commonly known as Peruvian lily/lily of the Incas is a bulbous flower belonging to the family Alstroemeriaceae. This plant is native to South America:Eastern Brazil, Chile. Those alstromeria that are from Chile grow during the winter months and the species that come from Brazil grow during the summer months. Except for the Alstreomeria graminea, all the other species of Alstroemeria are long-lived perennials. This plant has six tepals, six stamens, three loped stigma, and seed capsuled with three valves. It was named as genus Swedish baron Clas Alstromer by Carolus Linnaeus. The plant grows from a cluster of tubers.The stem of this plant grow up to 1.5 meter height. Leaves: Alstroemeria leaves are alternately veined. They come in various shape and sizes with smooth edges. 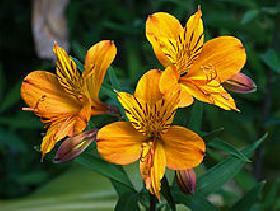 Flower: Alstroemeria gives rise to six tepaled flower that are grows up to 5 centimeters long. The flowers bloom in different shades of color: red, green, white, purple and orange. Hybrid: The method of hybriding is common in the plantation of Alstroemeria. As many as 190 cultivars have been developed. White, yellow,apricot, pink, purple, red, lavender and orange colored Alstroemeria have been developed. One of the most seen hybrid is the cross formed by the species from Chile and the specie from Brazil. These cultivars mostly grow in the early summer and late spring.